I’ve day-hiked parts of the BRT in the past but this was my first backpacking trip there. Accompanied by a couple other Sierra Clubbers, we hiked from the Boxley trail head to the Steel Creek Campground (mile 0 to 12.6). We got started from Boxley late on a gray and chilly Friday afternoon and set up camp after about 2.5 miles, before getting into the Arrington Creek drainage. Temperatures actually warmed a bit overnight and I had to kick off the sleeping bag a couple times to cool off. Saturday morning as we descended into the Arrington Creek drainage we passed several side channels that drop very steeply to the creek and probably form some spectacular cascades after a big rain. Arrington Creek itself was a good place to resupply drinking water and there were a couple large camp sites nearby. After leaving Arrington Creek we begin a long and sometimes steep climb to a bench on the next mountain. We were on that bench (now an old road) for several miles – passing old homesteads and other traces of human activity – before descending again. 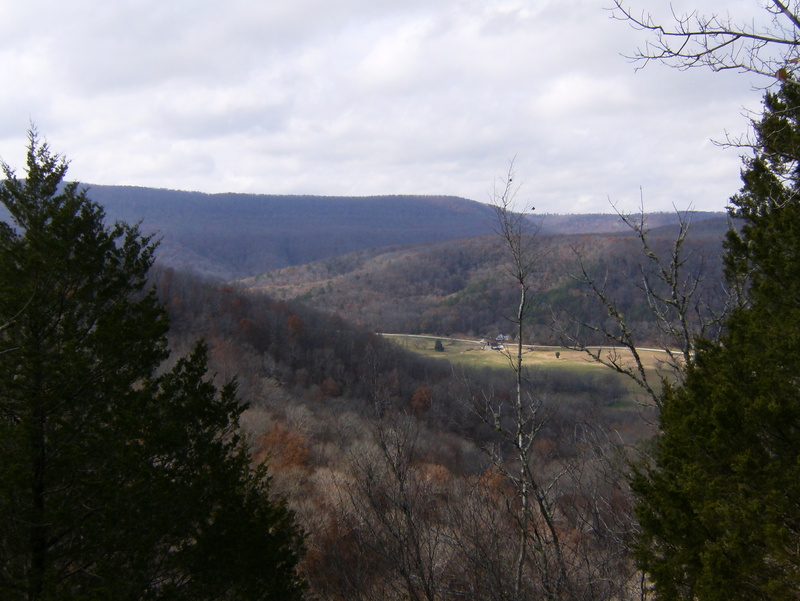 Part of that descent takes you along the edge of a bluff with a nice view of the Boxley Valley – a great place for our lunch break. After lunch we descended further and crossed Dry Creek – which actually had a small pool of water – and stopped for a bit. It started sprinkling so we covered our packs and got out the rain coats just in case. 10 minutes later it began to rain in earnest. We stopped at Running Creek to don the rain gear and refill our water bottles – this was our last water source for the day. The rain stopped after about 15 minutes. We climbed up on the next bluff and made it around the head of Big Hollow before stopping at an established camp site for the night. It was a very windy evening with sprinkles several times, an occasional glimpse of the almost-full moon, and lighting in the distance but it never did rain like we expected it to. We awoke Sunday to 67 degrees and sunshine. I never did make use of my sleeping bag that night. Continuing along the relatively flat area between Big Hollow and the Leatherwood drainage for a ways, we passed the sinkhole area at mile 10.3 and soon began the long descent toward the famous Ponca Bridge. We toured the Villines Homestead while we were in the area before beginning the final stretch to the Steel Creek campground. I expected this part to be relatively uninteresting and hadn’t really looked at it on the topo maps nor read others descriptions so I was a bit surprised at how nice it was. The trail climbs onto yet another bluff and winds its way in and out of several very steep drainages that are probably the site of yet more magnificent cascades after a big rain. And of course, the bluff has some nice vistas too. 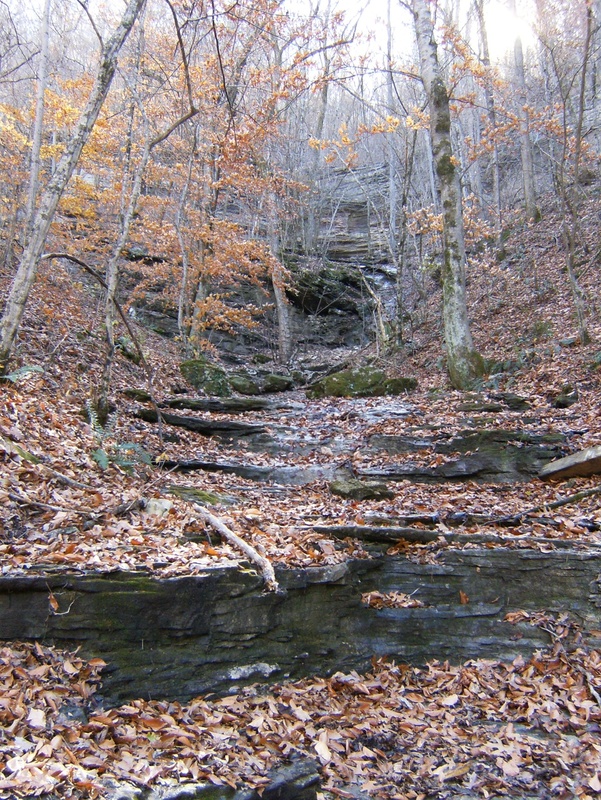 I’ve now hiked about 28 of the 63 miles of completed Buffalo River Trail (some of it more than once) and am going to try hiking the rest before next summer. 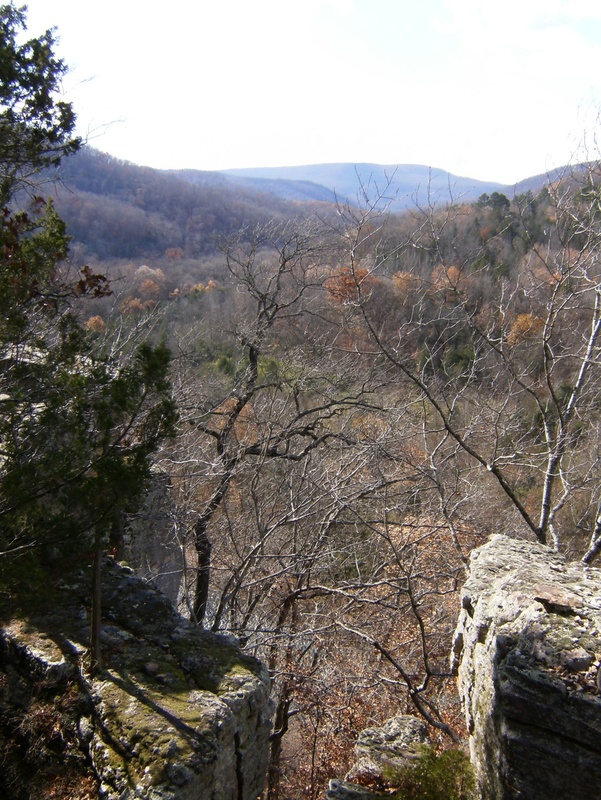 I’m also trying to finish my section-hiking of the Ozark Highland Trail so I’m going to be pretty busy, I think.